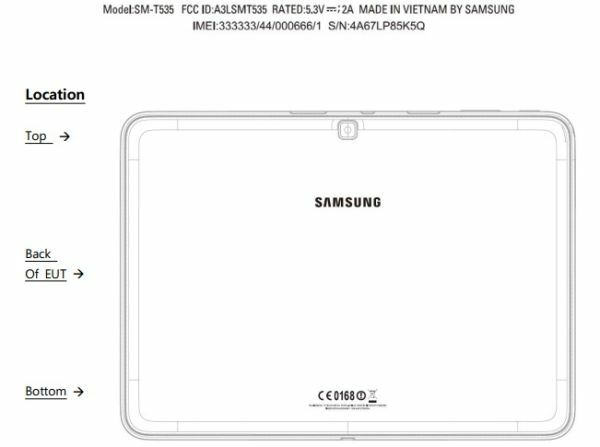 Samsung has long targeted their 7" Galaxy Tab model as a budget Android tablet, and now it seems they may be taking the 8" and 10.1" models in that direction. Newly leaked benchmark test results have confirmed past rumors that the new Galaxy Tab 8 and Galaxy Tab 10.1 will have largely the same specs as their predecessors. Both tablets feature the same quad-core CPU and screen resolution, and they have similar amounts of storage. In fact, aside from a slight bump in the amount of RAM and the CPU being faster than on last year's model, these are basically retreads of hardware that Samsung released last year (8 inch, 10.1 inch). The benchmarks (here, here) show that both tablets are running Android 4.4.2 KitKat on a 1.2GHz quad-core SnapDragon 400 CPU with 1GB or 1.5GB RAM, and 16GB Flash storage. Like last year's models the tablets have 2 cameras, with a 1.2MP front-facing camera and a 3MP rear camera.This is actually a step down for the 8" model, which had a 5MP camera last year. Screen resolution is 1280 x 800, just like last year's tablets. And of course they will have Wifi and Bluetooth. Update: I just notiecd that the Tab 3 10.1 had a dual-core Intel Atom chip. That means that the quad-core chip in the Tab 4 10.1 is more of a sidestep than an improvement. On a related note, the Tab 4 10.1 has also recently cleared the FCC, and there will be a model with cellular connectivity. After perusing these specs, it seems to me that Samsung is largely treading water with the Galaxy Tab line. Just about the only nice part of the specs is the (possibly ) more powerful CPU, and even that might not be much to write home about. While it is a SnapDragon CPU, it's by no means the best chip made by Qualcomm. When the Tab 3 line launched last year Samsung offered tablets that were several steps up from the bottom of the market. But now that Samsung has decided to hold still, they're going to let the bottom of the market catch up with them. Let's hope that Samsung adjusted their prices to match.